Sul velocissimo tracciato di Hockenheim esplode la lotta interna al team Williams, con Reutemann in testa al Mondiale ma boicottato dalla sua stessa squadra; la prima fila è delle Renault con Prost davanti ad Arnoux, quindi Reutemann e Jones con le Williams, Pironi (Ferrari) e Piquet (Brabham). 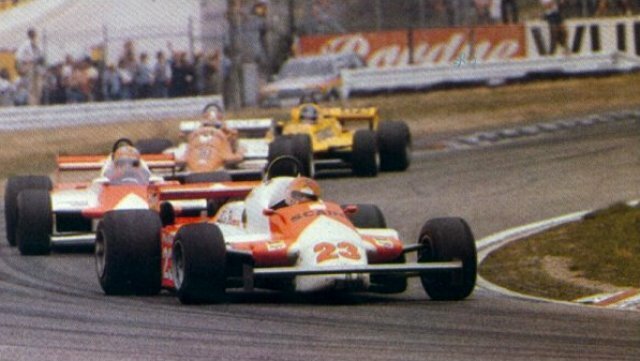 Al via Prost prende il comando davanti a Jones, e i due danno vita ad un emozionante duello, mentre dietro Piquet e Laffite (Ligier) aspettano l' evolversi della gara; Reutemann invece, partito con il muletto, è presto costretto al ritiro. Nella lotta di testa alla fine Jones, complice Arnoux, riesce ad avere la meglio su Prost e se ne va: per l' australiano sembra fatta ma il motore lo costringe a rallentare (terminerà 11°). Piquet è pronto ad approfittarne e a candidarsi come sfidante per il Titolo: Piquet vince così davanti a Prost e Laffite. 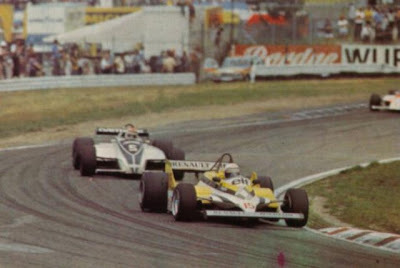 On the fast track of Hockenheim explodes infighting within the Williams team, with Reutemann head in the World Cup but boycotted by his own team, the first row is the Renault with Prost in front of Arnoux, then Reutemann and Jones with Williams, Pironi (Ferrari) and Piquet (Brabham). At the start Prost took the lead ahead of Jones, and they give life to an exciting duel, while behind Piquet and Laffite (Ligier) are waiting for the 'evolution of the race; Reutemann however, started with the forklift, is soon forced to retire. In the fight to head the end Jones, accomplice Arnoux, manages to get the better of Prost and goes: 's Australian seems to be made but the engine forced him to slow down (end 11th). Piquet is ready to take advantage of it and to stand as a challenger for the title: Piquet wins the case in front of Prost and Laffite. На быстрый трек Hockenheim взрывается борьба внутри команды Williams, с Reutemann головой в Кубке мира, но бойкотировал его собственной команды, первый ряд Renault с Prost перед Арну, то Reutemann и Джонс с Williams, Pironi (Ferrari) и Пике (Brabham). В начале Прост взял на себя инициативу перед Джонсом, и они дают жизнь захватывающей дуэли, а за Пике и Лаффит (Ligier) ждут "эволюции человечества; Reutemann однако, начал с погрузчика, вскоре вынужден уйти в отставку. В борьбе на пост главы концу Джонс, сообщник Арну, удалось взять верх над Прост и идет: "с австралийским, кажется, сделали, но двигатель заставил его замедлить (конец 11-е). Пике готов воспользоваться этим и баллотироваться в качестве претендента на титул: Пике выиграл дело перед Прост и Лаффит.